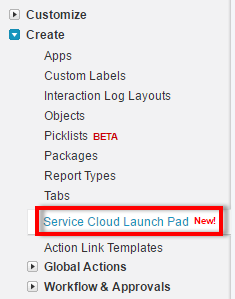 Launch Pad lets you deploy and test key Service Cloud features in your sandbox quickly and easily. If you want the latest and greatest of the console, this is the template for you. It includes the most-used console features, including keyboard shortcuts, the footer component, multi-monitor support and the ability to pin tabs. It also includes the most popular Service Cloud objects, including Cases, Accounts, Contacts, Reports and Dashboards. Get all the features of Standard Console, plus the ability to easily customize it with your company logo and branding scheme. 1. Go to Service Cloud Launch Pad. 3. Give any name to the App. 4. Click View to view the app and Customize to modify the app.